Yet even after deciphering its hieroglyphs, and marveling at its scarabs, mummies, obelisks, and sphinxes, Egyptian civilization remains one of history's most mysterious, as "other" as it is extraordinary. This chronological survey presents the complete history of ancient Egypt's three great Kingdoms: the Old Kingdom, when the pyramids were built and Egypt became a nation under the supreme rule of the pharaoh and the rules of Egyptian art were established; the Middle Kingdom, when Egypt was a nation fighting to restore its greatness; and the New Kingdom, when all the names we know today-Hatshepsut, Tutankhamen, Ramses the Great, Cleopatra, and others-first appeared. Professor Brier's 48 lectures glisten with the kind of vivid anecdotes and human glimpses that make this ancient world breathe again. "The fun of history is in the details," he notes. "Knowing that Ramses the Great was crippled by arthritis for the last decade of his long life makes us more sympathetic to the boastful monarch who fathered more than 100 children. If we understand what it was like to be a miner sent to the turquoise mines in the Sinai mountains in the summer, we will feel a kinship with our long-dead counterparts." This series will make you interesting. They might as well stick a guarantee on it. Just to give you an idea... there's a half hour on mummified animals. Mummified ANIMALS. There's already about two solid hours on human mummies, but Brier feels that to be complete you need to know about the animals as well. If you are thinking, "How am I going to get through thirty minutes on dried up animals, let alone 24 solid hours on Egypt?" let me assure you, it will be over before you know it and before you want it to be. I've listened to a lot of Teaching Company lectures in my time, and while they never have anyone truly boring you often are reminded that these people are all university professors. But Brier's delivery is almost mesmerizing, his enthusiasm for the subject positively boyish. This series will never require your patience. There may be special interest to those with an interest in Biblical history, whether you are Christian or otherwise. Whenever you reach a point where Biblical history intersects with Egyptian, Brier will stop and discuss it. There are several lectures devoted exclusively to the topic. I'll lay it out: Brier is a historian and therefore does not regard the Bible stories as literal truths, but he treats them with true sympathy and interest. His conclusions really surprised me, especially regarding the Exodus. His speculations on Joseph are perhaps more of a stretch. The one rather slight downside to the whole series is that Brier has some rather fanciful theories about the life and times... and death... of Tutankhamen, a lot of which have been, if I'm not mistaken, disproven in the years since this first came out and which anyway were never taken seriously in mainstream Egyptology. Speculating about the Bible is one thing, but Brier doesn't pretend it's anything but speculation. His Tutankhamen material is, despite disclaimers, told with the passion of a true believer, which makes it slightly tragic when you discover afterwards that some of the basic facts just aren't there. It makes for an interesting listen, at least. Overall, this is a MUST PURCHASE. Everyone needs a pair of really good shoes, a couple of good jackets, and a lecture series on Ancient Egypt. Do not hesitate. Dr. Brier does an excellent job delivering this series of lectures -- they are a true pleasure to listen to. 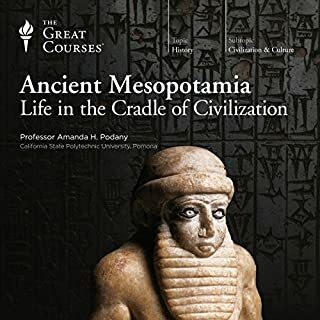 If you're shopping for your next Great Courses series and you're not immediately jazzed about ancient Egypt, after the first couple of lectures you will be, or at least I was. He keeps the narrative free from too much jargon while still packing in richly detailed descriptions. I also enjoyed the frequent anecdotes on the early Egyptologists and their contributions to the field. Dr. Brier will bring up some details often enough to feel redundant, but to be fair, I will probably never forget now that the Nile flows North and the winds blow South, making it trivial to navigate. However, my biggest gripe having only the audio available was his aversion to giving dates. I agree with him that the relative dating is more important, but if you're familiar with other Near Eastern ancient history, it makes it pretty difficult to align with other events in the Fertile Crescent. Not worth taking any stars off though, it just means looking up some things in a reference as or after you listen. I have been an audible customer for many years now with over 1000 books in my library but this is my first review. I write it because of another review of this book that I found to be completely off the mark. This course is an introduction and as such, it is basic history and background. With over 2,500 years worth of history to cover, it would be impossible to go into much detail. Having said this, Dr. Brier does an excellent job of making the history and culture come alive. His knowledge of,and passion for, the subject come through in vivid detail. The course touches on history, religion, culture and legacy of the oldest and longest lasting civilization on the planet, not an easy task for a single course. The review which prompted this response stated that Dr. Brier seemed to talk down to his audience and pushed forward his own opinions too much. He did, but with reason. Dr. Brier is famous as the PBS star who's films have educated an entire generation about the wonders of Egypt. He is the world's foremost expert on the process of making mummies and is the only one in modern times to successfully reproduce an authentic mummified body. There is no one who better combines the expertise, knowledge, experience and showmanship then Dr. Brier. For basic overview and general knowledge this course is excellent, informative and enjoyable. If you desire more in depth knowledge, then a more specific title would be more valuable to you. If you like mummies, this course has more specific information then any other I have found. These lectures are incredible. 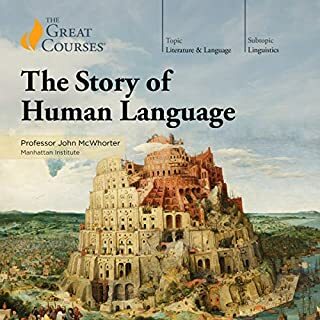 I have done a few of the Great Courses series here on audible, and I am usually bored and a little lost by the last few lectures. I had the opposite experience with this one...I was actually more enthralled and intrigued as they went on, and I mourned the last lecture when it was over because I didn't want the story to end!! So much magic, intrigue, mystery and drama. I can't say enough good things about this. It was so good that I'm actually starting it over to listen to it again. I never knew I would be so into Egyptology, but really, what's not to like?? It's amazing!! Bob Brier does a wonderful job, he is fun to listen to, New York accent and all. Truly amazing stuff here. Cleopatra and Hatshepsut...girl power!! Snefru and Rameses the Great were awesome too! Really all the "characters" presented here are super interesting. What about Professor Bob Brier’s performance did you like? He seems really passionate about what he's taking about. He is never boring. I constantly found myself saying "woooow" and "cooool" out loud while listening to these lectures on my headphones, eliciting some strange looks from my boyfriend. Just listen, and become obsessed!! I did!! What made the experience of listening to The History of Ancient Egypt the most enjoyable? The professor is engaging and a great story teller. He gives you all the information you could want without boring you. He does an excellent job of making you want to learn more about Ancient Egypt. I feel like I got an accurate portrayal of the psychology, religion, architecture, medicine, magic, technology, and sociology of the Ancient Egyptians. Absolutely. I listened to to for hours at a time and never lost interest. So well taught! So interesting! Yes, I would recommend this to anyone who has even a passing interest in the topic. What other book might you compare The History of Ancient Egypt to and why? This is a series of lectures. I have listened to several such programs. This one is so far my favorite. Have you listened to any of Professor Bob Brier’s other performances before? How does this one compare? I have heard nothing else by Mr. Brier. I would however like to. The lecturer did an amazing job keeping this interesting. It is broken into half hour lectures and each one was a joy to experience. If you are like I was and you keep looking at the Great Lectures wondering if you might enjoy them then this is the perfect place to start. What did you love best about The History of Ancient Egypt? I used to think that the history of Ancient Egypt was as overwhelming and daunting as a trek across the desert. Professor Brier takes the listener step by step and breaks it down into manageable sections, like a traveler going from oasis to oasis, with time for review and reflection between segments. He also tells some great campfire stories about colorful Egyptologists in history, his own experiences in Egypt, and his work on creating a modern mummy. Bob Brier does a lot of television documentaries, and he's just the same in his lectures. He gives his own theories about historical events, as well as theories by others, and lets the listener decide. I enjoyed his lectures about Egyptians referenced in the Hebrew Bible/ Old Testament. Specifically, Joseph and Moses. The lecture about how he created a modern mummy was kind of gross, but so interesting that I listened to it more than once! I'm not sure if this is because he's from New York, but he talks about the ancient Egyptians in the way someone would talk about people in their neighborhood or their extended family. For example, he called Pharaoh Snefru a great builder, but also a bit of a nerd. He loves the Ancient Egyptians so much that he tries to present as complete portrait as he can: the good, the bad, and the quirky. I have always loved ancient Egypt. It seems so distant, alien almost magical. This magnificent lecture cycle brings this world to vibrant life. The danger of going in depth in history is that it can get dull. At no point does this epic set become boring. The author and presenter Professor Bob Brier sounds like your average New Joysey taxi driver which is charming and always interesting. He makes the content approachable, even fun. It’s fascinating at every turn. He plots the 3,000 years of the oldest greatest civilization on earth in fulfilling, thought provoking detail. If you have any interest in this area you will be delighted, even if you have never gotten further than India Jones in archeology you will be highly entertained. Give it a shot. It’s a ton of very interesting content for a single credit. There can be no better way to soak up a commute than 24 solid hours of ancient history made comprehensible to the modern mind. The professor organized this course in an understandable, accessible way. I learned much and it was entertaining. This is a solidly good course. 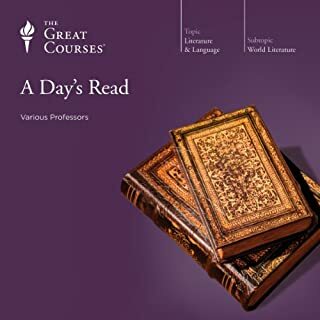 Covering 3,000 years of history in 48 lectures is not easy (some lectures covered 200 years of history: the entire length of the existence of the United States---Imagine doing that in 30 minutes!). The professor is an encyclopedia on the topic. Because this is ancient history and not a lot is definitively known about the actual historical events of the time (be it political, religious, or military), more of the course is focused on the archaeological discoveries of artifacts and royal tombs as well as descriptions of the ancient structures and temples built than the recounting of actual historical events. But a lot of history is covered. I can't exactly put my finger on it but the professor’s style of recounting it didn't fully resonate with me. Maybe I expected more from a general storytelling theme perspective. Not sure I can articulate it well but it is hard for me to rate this higher than a 3.5 compared with other Great Courses. Most of the course focused on the Pharaohs and not a lot of time spent on the everyday ancient Egyptian. This is neither a plus nor a minus but thought I'd call it out if you are looking for the latter! 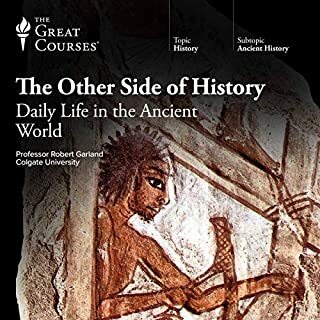 Bottom line: I recommend this course to anyone interested in ancient history or even non history buffs who find themselves intrigued by ancient Egyptian society. You will especially find this course thrilling if archaeology is your passion. 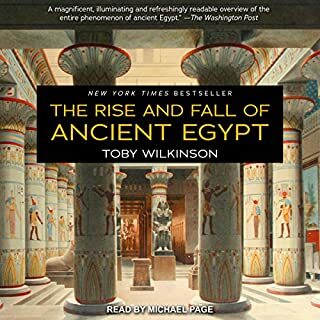 Where does The History of Ancient Egypt rank among all the audiobooks you’ve listened to so far? This is a really great lecture series. Fascinating material that is wonderfully presented. The lecturer's personality really comes through. 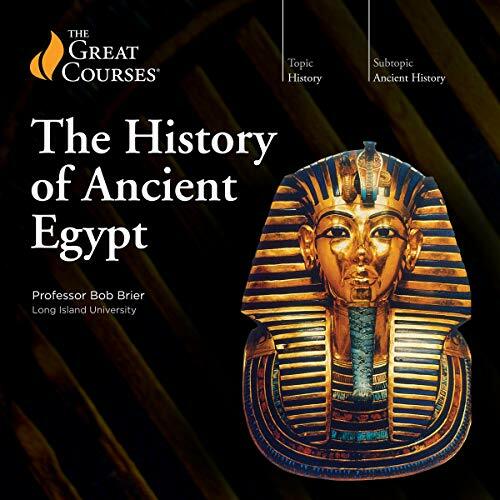 I knew very little about Ancient Egypt before starting this and the course really gripped me. It is roughly chronological but with a few tangential lectures focussing on specific topics (e.g. mummies). At 48 lectures it is a long course, but for me the time really sped by. Highly recommended. A great story, well told. Neatly compressed story of ancient Egypt, delivered with brio and authority. Generally accepted facts enriched along the way with personal theories and historic asides. Very enjoyable. Great audiobook. Could've trimmed a few of the less interesting lectures, but perhaps that's just down to taste. Overall excellent. Will be listening to more from The Great Courses. 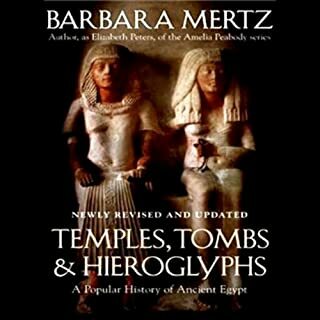 I purchased this lecture because I was going for a short trip to Egypt and wanting to understand a little bit about Egypt. I got more than that, I seriously got hooked to learn more and really enjoyed this Professor Brier. I wish I could attend his lecture in person one day and can have a tea with him. His goal has been met on me; I was the guide for my husband as we stroll through the great pyramids of Giza sand Cairo museum. I have an interest in the subject and was pleased to see this series of lectures. I started listening and very soon my husband was drawn in too; we both enjoyed it immensely. Yes, I would definitely recommend this to a friend. While after a while, the canned applause and the music at the start can start to grate, the enthusiasm of the speaker shines through the delivery as well as his sense of humour. I learned a great deal from this course and was greatly entertained by it. What more can you ask for? What other book might you compare The History of Ancient Egypt to, and why? What does Professor Bob Brier bring to the story that you wouldn’t experience if you had only read the book? What did you like most about The History of Ancient Egypt? The narrator/lecturer obviously has a great passion for the subject and it was infectious to the listener. What was one of the most memorable moments of The History of Ancient Egypt? The stories of the early pharaohs. Have you listened to any of Professor Bob Brier’s other performances? How does this one compare? I took up this course, because I was impressed with an exposition in a museum. I didn’t expect, I’ll endure the whole course of 24 hours, but I did, and it wasn’t a challenge at all! I enjoyed every minute of it. It’s presented in a light conversational manner, with almost no dates (‘you won’t remember them anyway!’), but easy-to-follow chronology and with so many tiny details about people and events that I started to feel they were real indeed, and these are not just stories being told. One of the purposes of this course was to inspire further learning, and and I’m inspired and overwhelmed with what I want to do next and learn more about Egypt. This course is absolutely fantastic. loved it. really in depth and interesting account of 3000 years of ancient Egypt. listened to it while cycling to work. Such an interesting series of lectures. The telling of history through stories makes it so engaging and I learned so much. Only distraction was the narrator’s inability to pronounce the letter H - YUGE! It's well worth it, but honestly I felt like it went too fast and didn't cover enough detail. But the course was still 48 episodes of great information! It's just Egyptian history is so long. This is the book to read to get a map of Ancient Egypt in your head. It's an intro, and you could spend another 6 episodes on each episode in the course. If my lecturers at uni had been this interesting I never would have given up Egyptology. Really really good overall history by a guy who loves his field. I echo his recommendation about the Elizabeth Peters books they are wonderful. Hope he records another series that is a closer look at some topics. Very entertaining, educational and easy listen. Bob's passion and love for egypt helps push you through 24 hours of amazing content. Bob Brier does a wonderful job narrating his series of lectures on the history of Egypt. His speaking style is warm, engaging and easy to listen to. The journey he takes us on through the history of Egypt is enthralling. He has made me more interested in the history of this great civilisation. what can I say. It was Yuge! Outstanding in every way. Such a pleasure to listen to such an intelligent and passionate scholar. This far exceded my expectations. Exceptional, informative and amazingly presented. Easily the most compelling history course I have listened too. Amazing in every way. I cannot recommend it enough. The lecturer is clearly very passionate about Egyptology and he makes it very interesting. Only thing that annoyed me was how often he says “yuge” instead of huge. Overall this was a fantastic introduction for someone who knew very little about ancient Egypt. I so enjoyed these lectures. Professor Brier’s obvious passion for his subject shines through. Fabulous. Prof. Brier made all the difference. He is an outstanding lecturer making this course so enjoyable it was a shame for it to end.